This is a simple, spicy Indian lunch or brunch made with rice and potatoes. Perfect as a side dish with curry, too. Boil the potatoes until cooked. Drain and set aside to cool, then peel and cut into 1cm/½in cubes. Put the rice in a sieve and wash gently but thoroughly under cold running water. Empty it into a bowl, cover generously with water and leave to soak for two minutes. Drain and leave in the sieve set over a bowl. Put the oil in a large, non-stick frying pan and set it over a medium-high heat. When hot, add the asafoetida and the urad dal. As soon as the dal starts to pick up a little colour, add the mustard seeds, cumin seeds and chilli (whatever type you are using). As soon as the mustard seeds start to pop, a matter of seconds, add the curry leaves (take care as they will splutter), then the onion and potatoes. Lower to a medium heat and fry, stirring now and again, for 3-4 minutes or until the onion and potatoes are slightly browned. Sprinkle a pinch of salt over the top and stir. Add the poha rice, gently breaking up any lumps, and sprinkle ½ teaspoon of salt and the sugar over the top. Cook on a low heat for 3-4 minutes, tossing frequently by lifting all the ingredients from the bottom of the pan with a flat spatula and folding them over, until the poha is heated through. Cover and set aside until you are ready to eat. 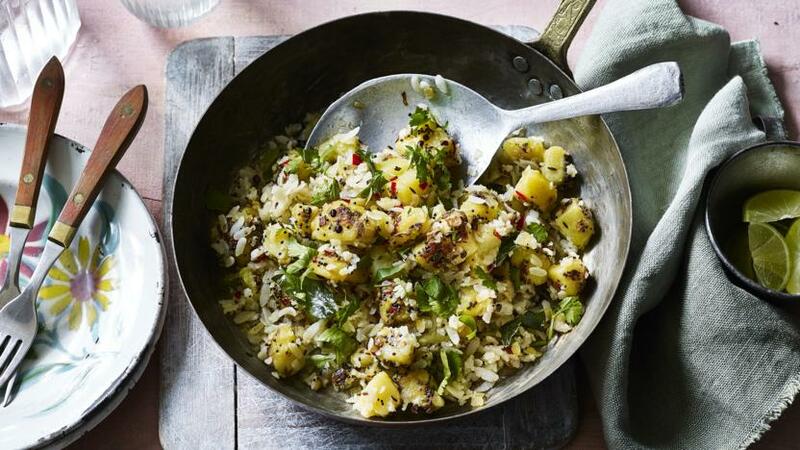 To serve, garnish the poha potatoes with fresh coriander and serve with lime or lemon wedges. Serve with fresh salad and/or raita.